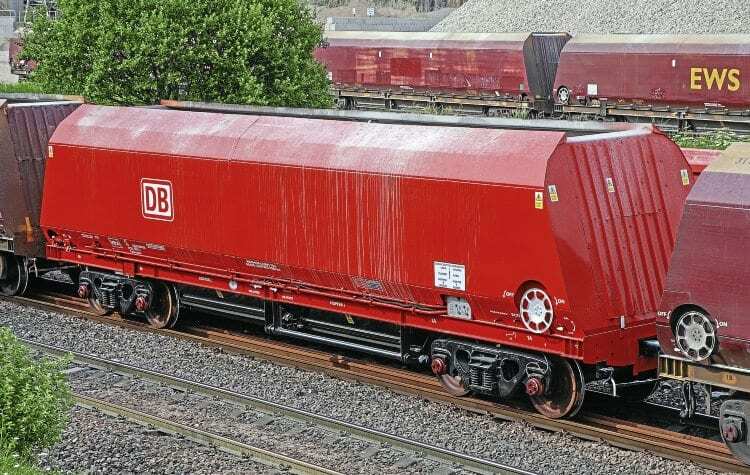 Now freshly repainted in DB red, the cut-down former coal hopper has gained a new 12-digit number and is currently being trialled in service for a possible follow-on fleet. Stoke-on-Trent, following brake tests and a repaint. The bright red HRA aggregates hopper has received the new 12-digit UIC/ERA number No. 41 70 6723 001-7 GB-DBSUK (not DBCUK) and the UIC designation Fabnooss. Its painted capacity is 76.9-tonnes with a tare of 24.7-tonnes, which means it is slightly heavier than its original specification (see June issue). There is a question mark over the exchange code 41 when recent renumbers of DB wagons have received 82. The prototype departed Stoke-on-Trent on June 2 for Warrington Arpley behind No. 66102. It had made its way to Peak Forest by June 5 and was still on its own in the sidings by the signalbox six days later. However, just a few days later it had been inserted in a set of HTAs and was being assessed in normal service. Read more News and Features in the August issue of RE – on sale now!